I don’t think most are interested in reading a book review unless they’ve either read the book or are definitely planning to read it. That’s why I’m such a big fan of the concept of the From Left to Write online blogger book club. Instead of writing a book review, the book is meant to serve as a writing prompt or inspiration for a post in which I can draw on and blog about my own personal experiences. July’s book is a debut fiction novel by Elizabeth L. Silver – The Execution of Noa P. Singleton. The story switches between narration by Noa in the first person and narration by the mother of the girl Noa is in prison for killing – in the form of letters to her dead daughter. Immediately Noa is revealed as being on death row for the murder of a girl named Sarah, but we don’t know how said murder or its trial occurred. Slowly, those occurrences are revealed. However, I’m not going to write about them. I’m going to write about a topic discussed at length in one chapter of the book – the last meal. It may not be Monday because I didn’t think it was worth it to publish a full MIMM post on a holiday, but Memorial Day starts with M and so does Marvelous, so there’s no reason I can’t keep the alliteration train chuggin’ at full speed. My work day went south the second I picked up my cubicle phone this morning to listen to a voicemail, so I really need to focus on marvelous and not mad. Which is how I’m feeling. Thanks Katie for hosting this party! Pretend the Monday says Memorial Day. Marvelous is…making it to my gym’s Friday evening step class. I haven’t been able to leave work on time for that class in awhile but I decided it was the Friday before a holiday weekend so if any day I was going to leave early, it’d be that day. The step class was so fun – a routine with both familiar and new moves, a high-energy instructor who demanded cheers from us as we worked out, and fantastic remixes of old favorites like “The Call”. Great way to kick off the holiday weekend. The Barre: A Real Food Giveaway ends tonight at 11:59PM EST – don’t forget to enter! I am blown away by your support on my post yesterday. I have to admit that when I woke up that morning, I felt so beyond low. I have never felt that level of hopelessness before. I had no idea how I was going to get through the day with my mind being SO damn mean to me. 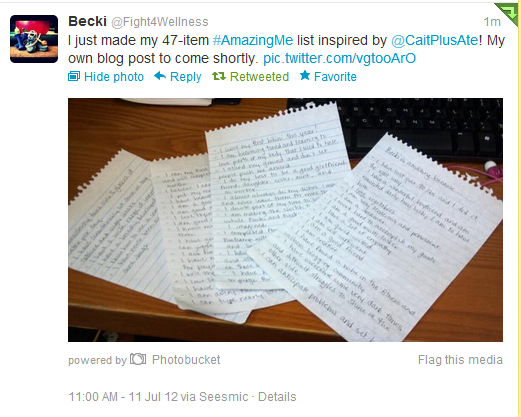 But making my #AmazingMe list helped, and the comments I got on the post truly made me teary-eyed. Thank you from the bottom of my heart for reading my blog, commenting, and sharing with me your own feelings about negative thoughts and holding ourselves to ridiculously high standards. I already am seeing some lists pop up – and I am going to read every single one! 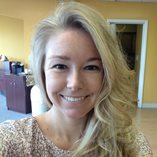 Becki is going to blog her list – can’t wait! And talk about timing – Lindsay published an amazing post today in which she fights her brain’s negative body image thoughts with specific positive thoughts about each part of her. It’s clear that every part of Lindsay combines to make one AMAZING blogger who dreams up the best recipes and runs a huge, and growing, Foodie Pen Pals program! 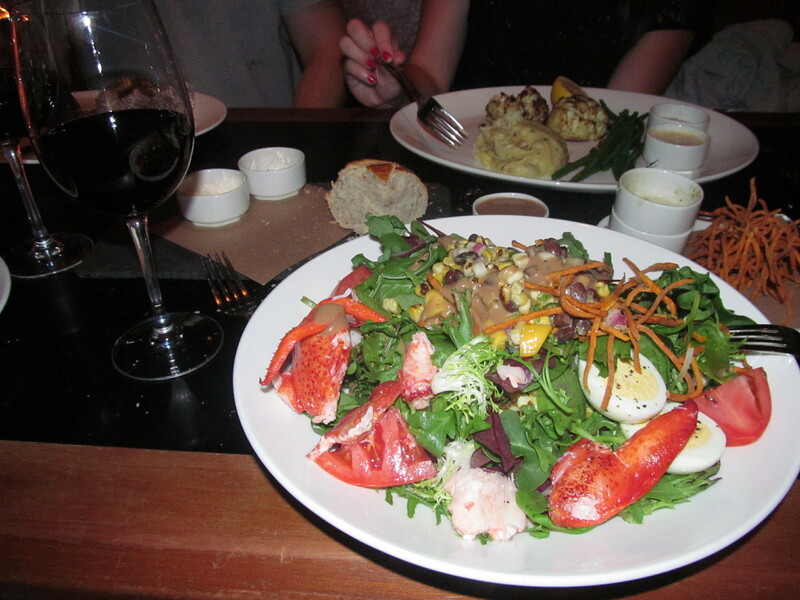 So today I have both old and new restaurant food photos to share, so thought another WIAW Photo Dump was appropriate! I can’t really bear the thought that some of my restaurant photos, even the ones from months ago, will go unseen by my readers. Thanks to Jenn of Peas & Crayons for making sure this delicious party happens every week. 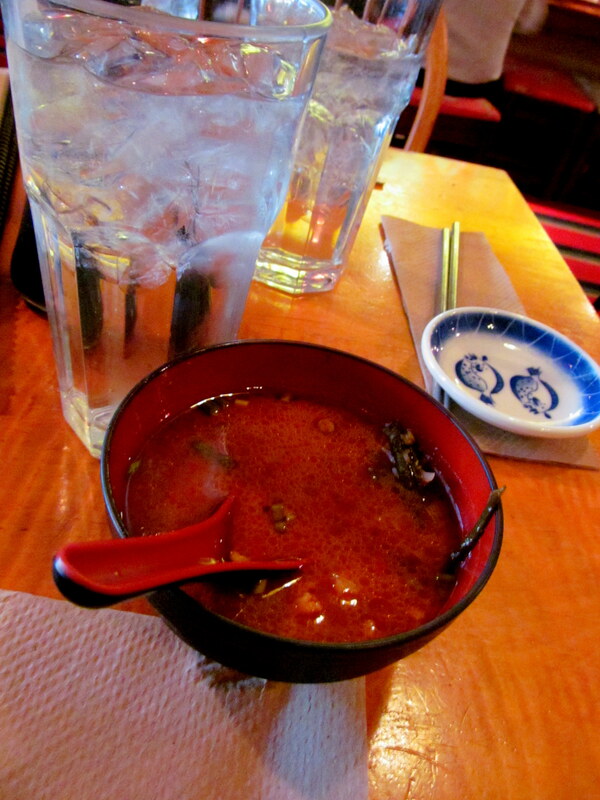 Best miso soup I’ve ever had, from Miya’s Sushi in New Haven, CT. Made with seaweed foraged from the Long Island Sound! 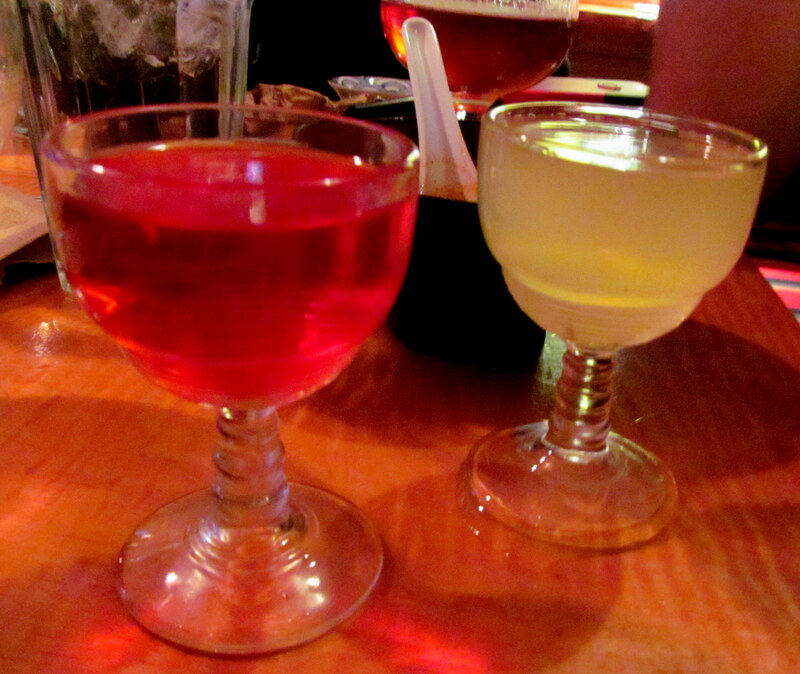 Samples of Miya’s sake! Best ever. One was super salty (meant to taste like the ocean) and one was sweet. 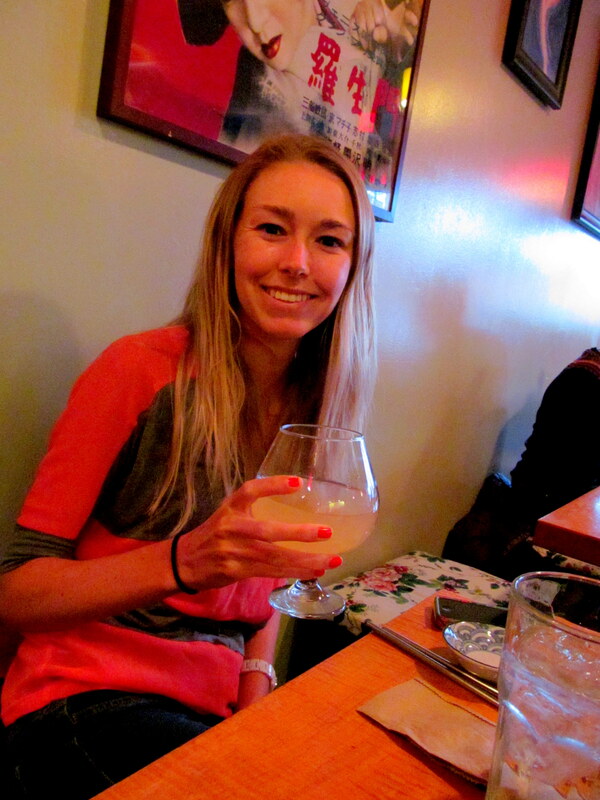 Me and a full-size sake at Miya’s, back in March. 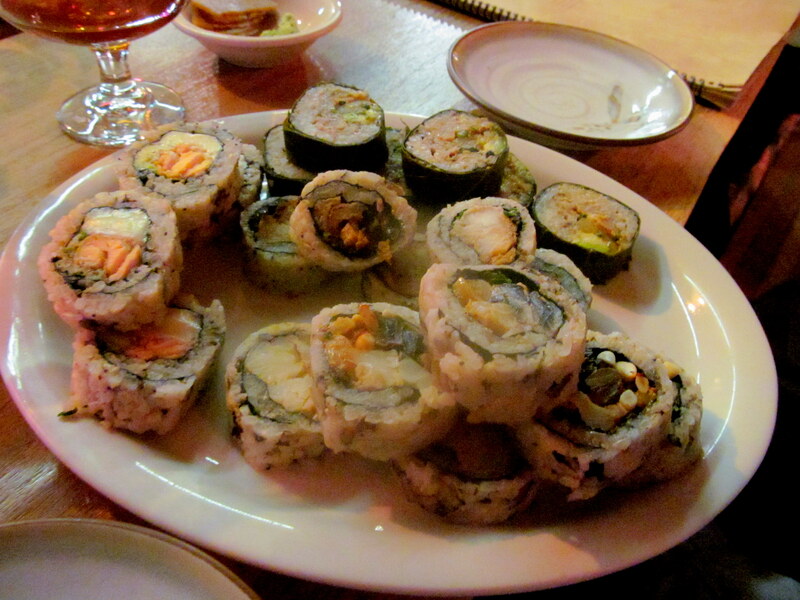 Array of Miya’s sushi – all automatically made with brown rice. One roll had brie, and one was wrapped in grapeleaves! 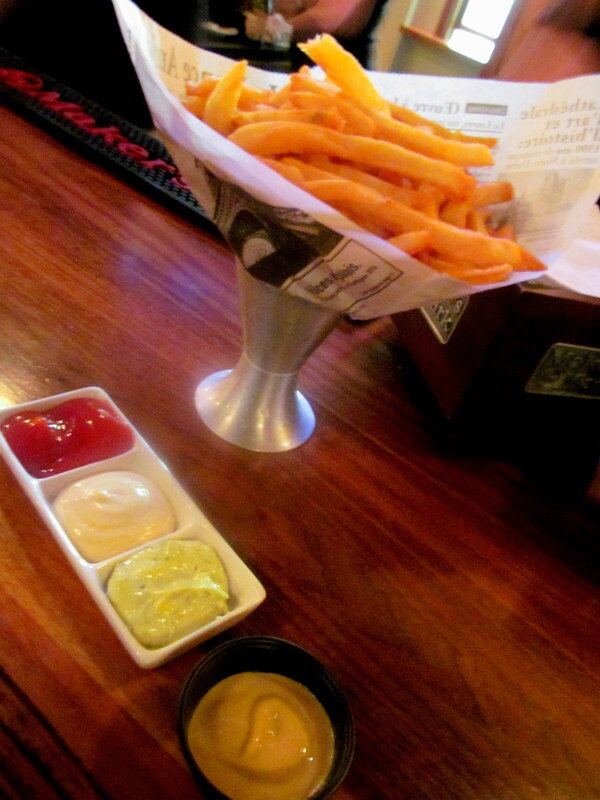 Some of the best fries I’ve ever had, with ketchup, mayo, pesto aioli, and mustard, at Rudy’s in New Haven, CT.
Pear vodka martini on Franklin Ave in Hartford. 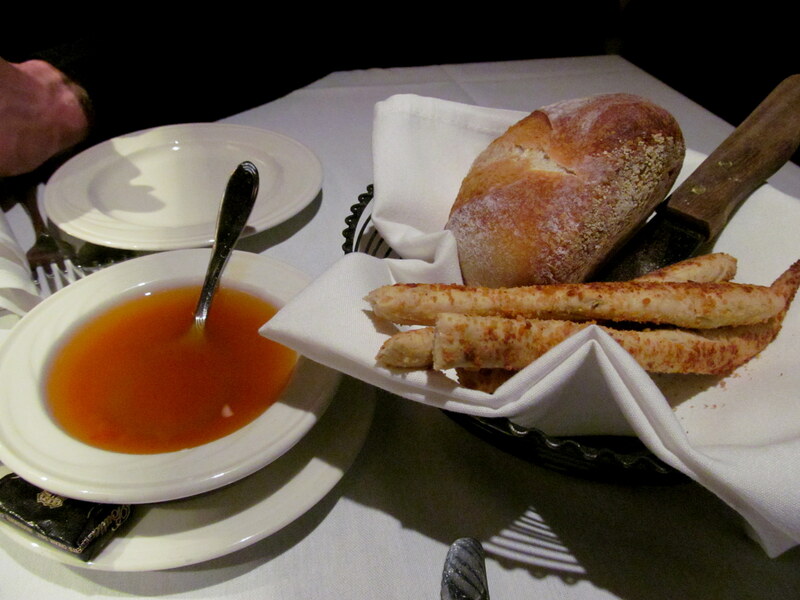 Amazingly yummy bread sticks and EVOO/tomato-based dip at Carbone’s on Franklin Ave in Hartford. 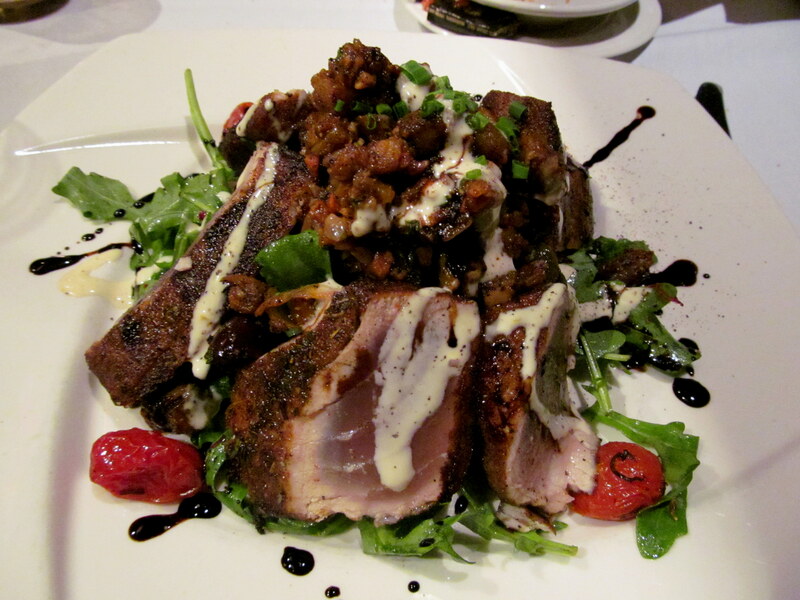 Ahi tuna with balsamic vinegar at Carbone’s – so amazing! 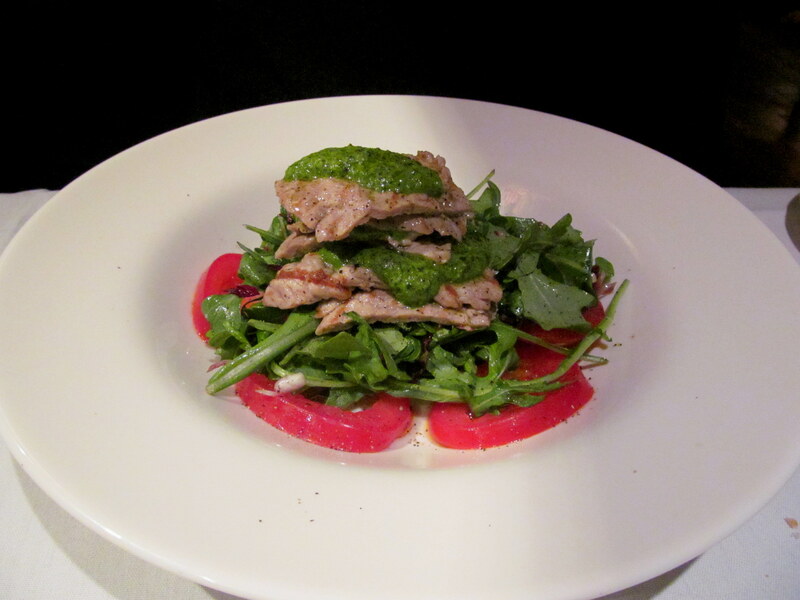 Grilled veal scallopini from Carbone’s light menu, served over sliced tomatoes, lemon, baby arugula, and cilantro pesto. My first time having veal and it was a winner. 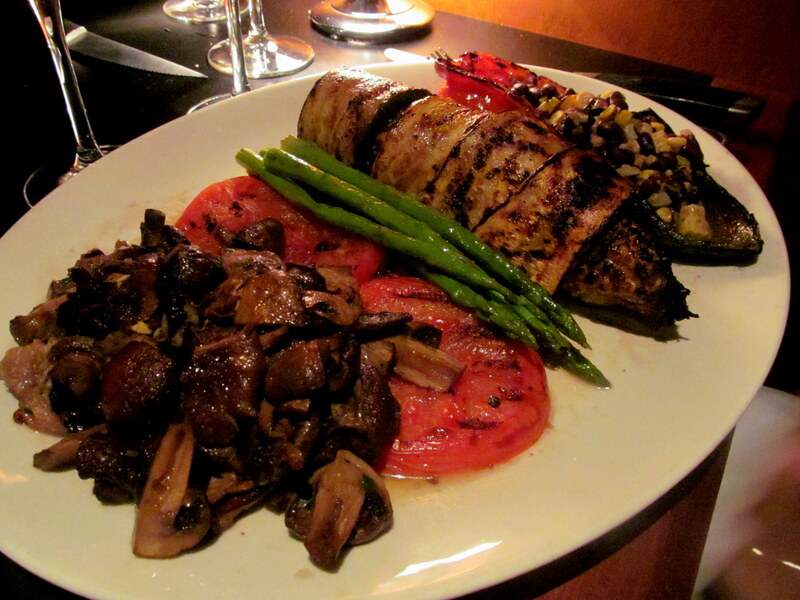 Jeff’s dinner at J. Gilbert’s this past Thursday – veggie platter of mushrooms, asparagus, tomatoes, corn on the cob, zucchini, and black beans/corn in a red pepper. CRAZY AMAZING I’M GETTING THIS NEXT TIME. A red blend at J. Gilbert’s this past Thursday, and some of their amazing sourdough bread. 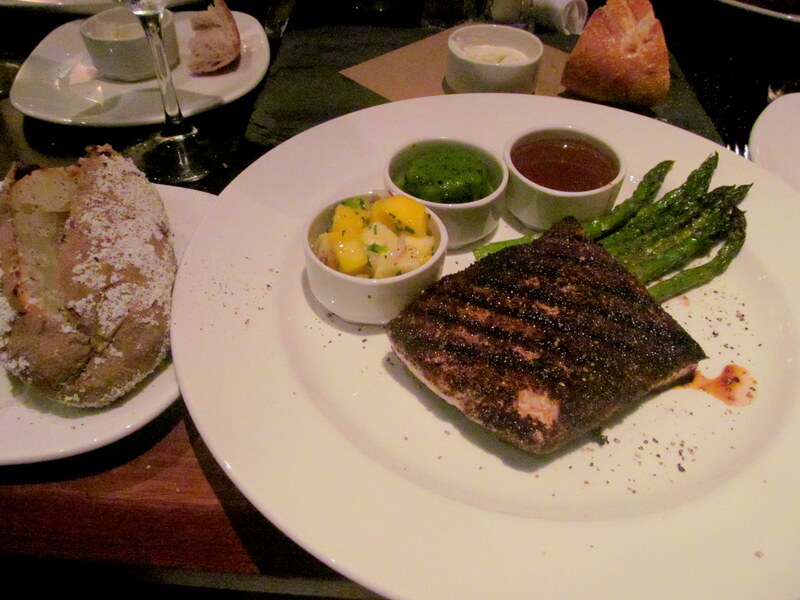 J. Gilbert’s special on Thursday – had to get it – grilled swordfish with red wine demi glace and chive butter on the side. Sides were grilled asparagus and a baked potato with mango salsa. I can’t get over it still! 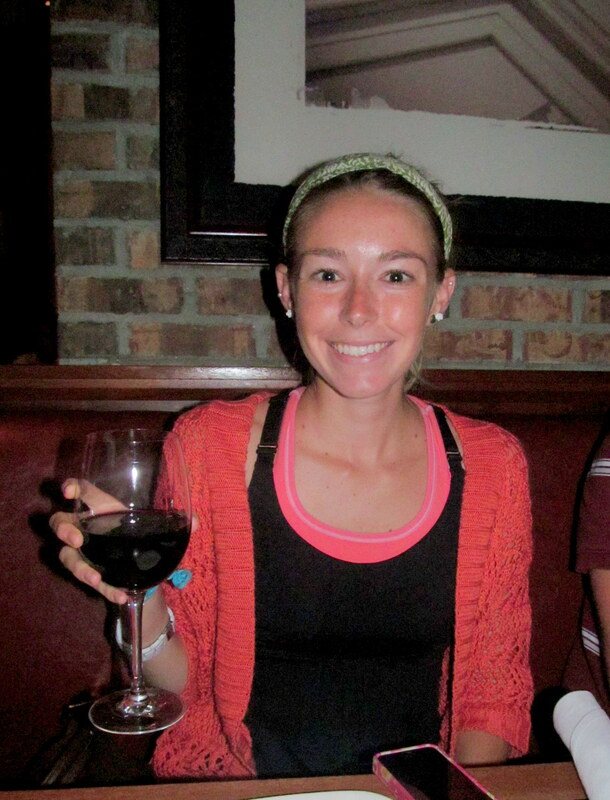 BIG glass of Merlot at Matthew’s in Unionville, CT on Saturday. Eating a caper and salmon cake sent out complimentary by Matthew himself. I think you can also tell that the last photos are more recent because I’ve gotten a little better with my camera! Wow, my inner arm in the above photo is also quite ghostly. Looks like I need to do some arm flipping next time I tan. And now that I’ve dumped all my restaurant photos, maybe this will make room for more daily eats photos in addition to the restaurant photos as well! Is that something you guys would be interested in? Which of the photos looks the most appetizing to you? Do you enjoy my way of doing WIAW, aka photo dumps? Maybe I’ll do a traditional WIAW one of these days! Have you made your #AmazingMe list yet? Don’t forget to share it with me on Instagram, Twitter, Facebook, the comments…sky’s the limit! People often ask me what my favorite restaurant is, since I’m such a fanatic. It’s a fair question! And if you follow me on Twitter, you may know what the answer is, seeing as I’ve checked in there four times in the last two weeks (and I’m the Mayor 😀 shut up, it matters). If you guessed J. Gilbert’s, you are spot-on! I’ve done a full write-up on a visit (when they came out with a new menu) and have mentioned them countless times. I’m a big fan of tweeting every experience I have there too. 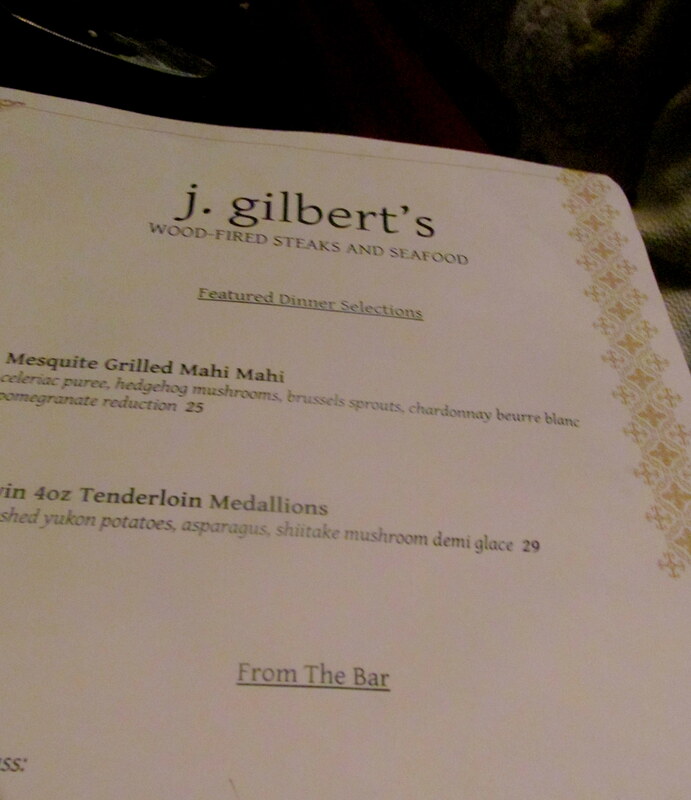 When I first started visiting J. Gilbert’s, I’d order the same thing every single time – 6 oz. filet mignon, baked potato, and asparagus. 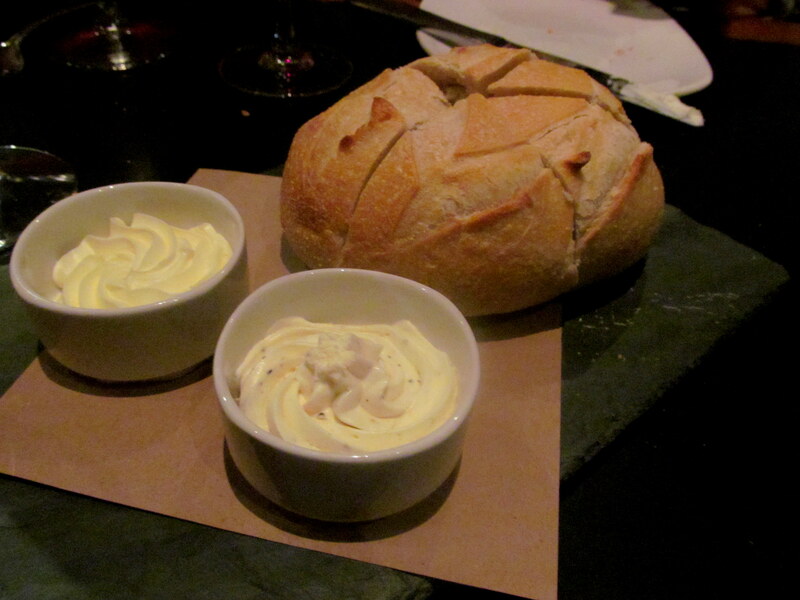 Oh, along with their awesome sourdough bread. The butter on the right is pastrami butter! But then I became an adventurarian (genius term Heather came up with for my style of eating) and began to feel the need to get something different every single time. And that’s totally possible, thanks to the constantly-rotating selection of specials. Jeff’s latest special selection – 14 oz veal with a fig demi glace and lobster risotto! I love taking friends to J. Gilbert’s because I KNOW they will love it, no matter what they order. However, there are certain things that are their specialty. When Jeff and I took our friend Kelly there a couple weeks ago, we helped her pick out a meal that was a sampler of what J. Gilbert’s does best, wood-fired steaks and seafood. 4oz filet, crab cake, lobster risotto, lobster mac n cheese. The bar has an amazing atmosphere. I love going there to hang out and catch up with friends, or family. 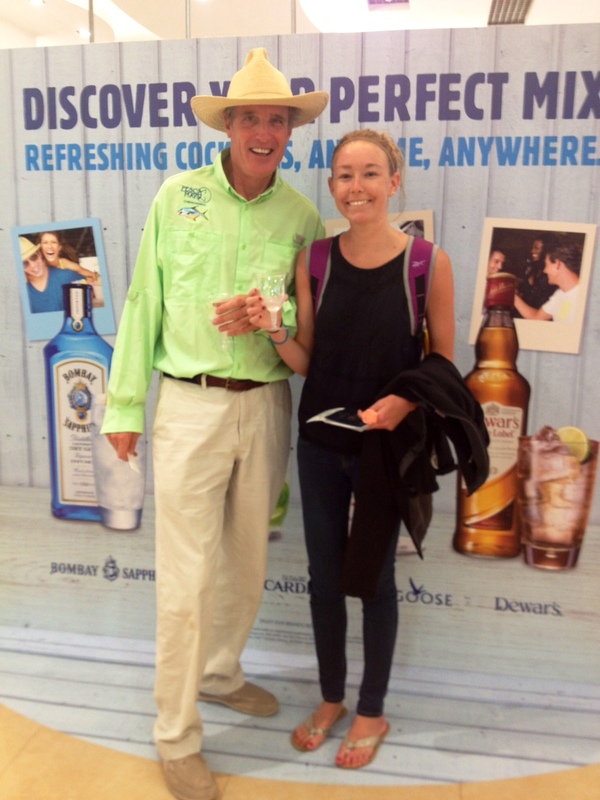 The bartenders are courteous and really fun to chat with. J. Gilbert’s boasts an extremely impressive wine collection, but their cocktails ain’t half bad either. Lemon Basil Manhattan: Maker’s Mark, lemon, basil, simple syrup, pure cane sugar. 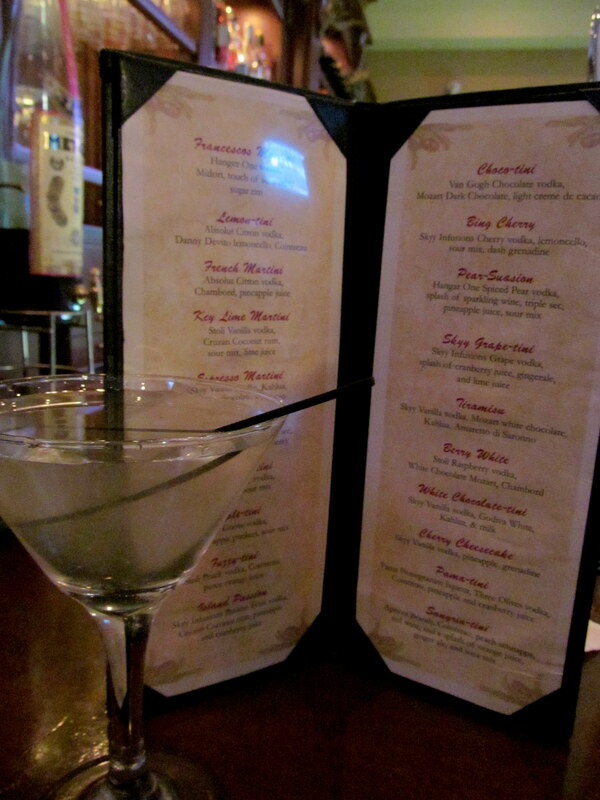 The bar also has a great happy hour, including a Sunday option, from 4-8pm! I love Sundays at J. Gilbert’s. A nice way to wind down the weekend! My favorite happy hour app, the chicken quesadilla. 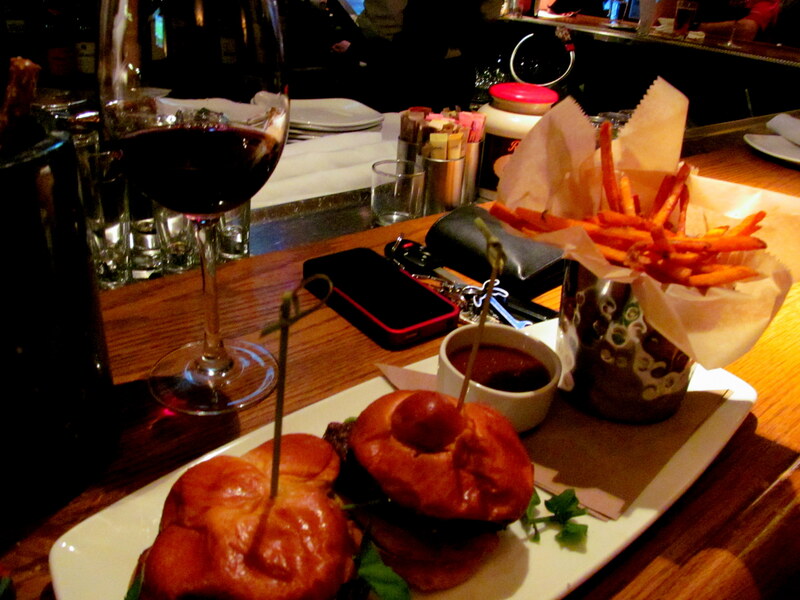 Another happy hour option, filet mignon sliders with sweet potato shoestring fries. 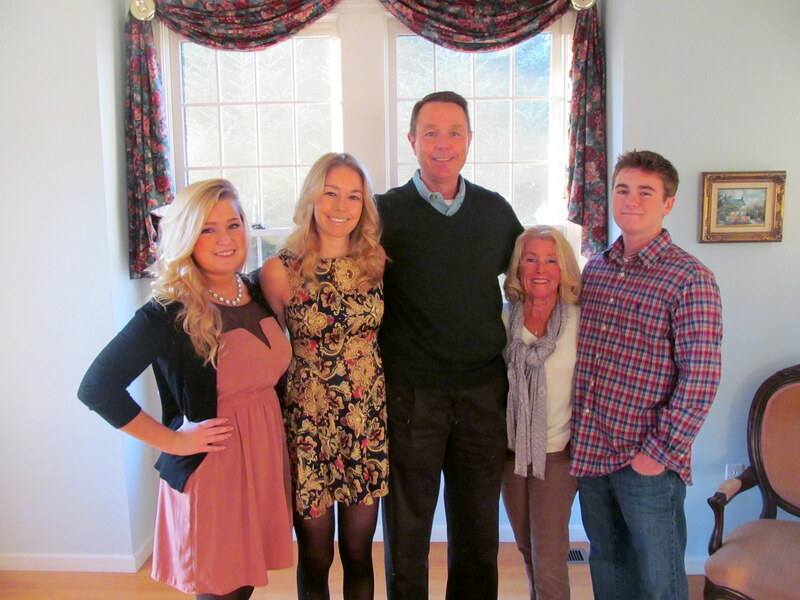 My family celebrates almost every special occasion at J. Gilbert’s. 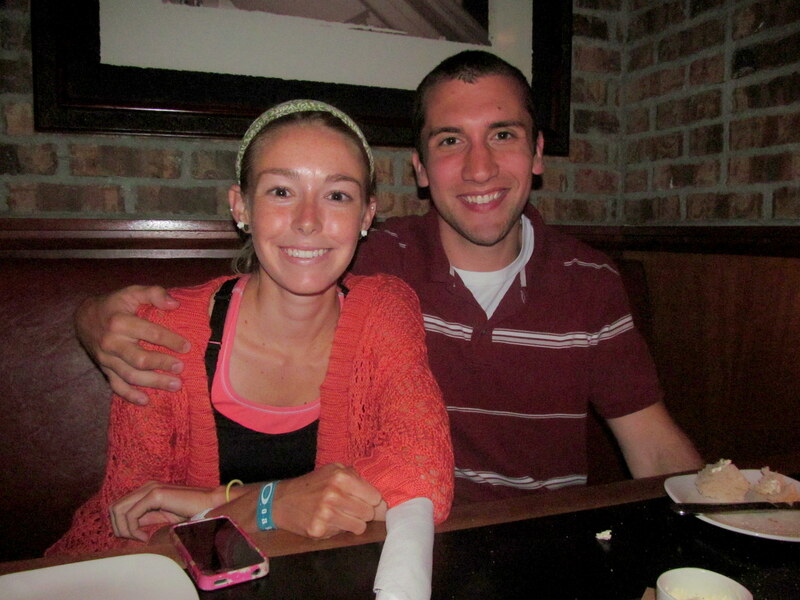 My parents and I recently had dinner there to celebrate my 23rd birthday. 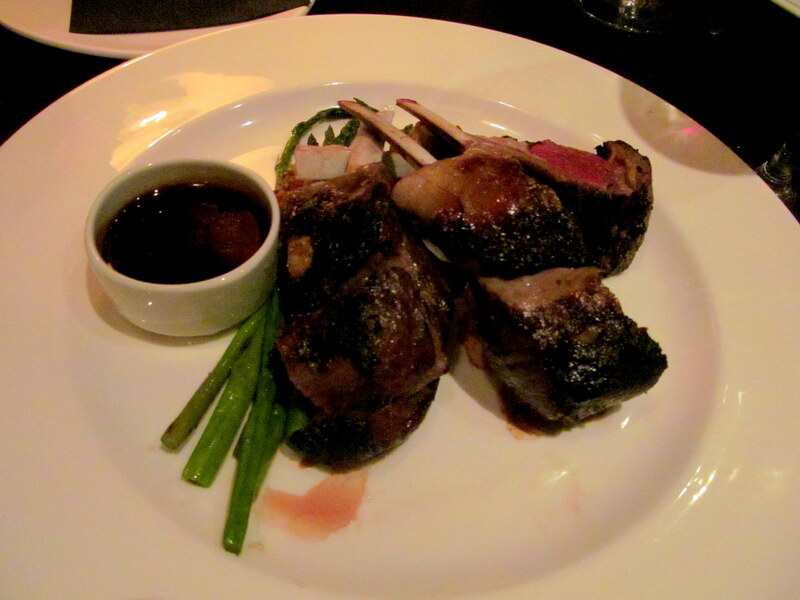 I went all out and ordered the rack of lamb. My dad’s swordfish was a work of art (you may recognize it as the cover photo on the Cait Plus Ate Facebook page). When my Nana Connie came to visit, we took her to J. Gilbert’s TWICE! 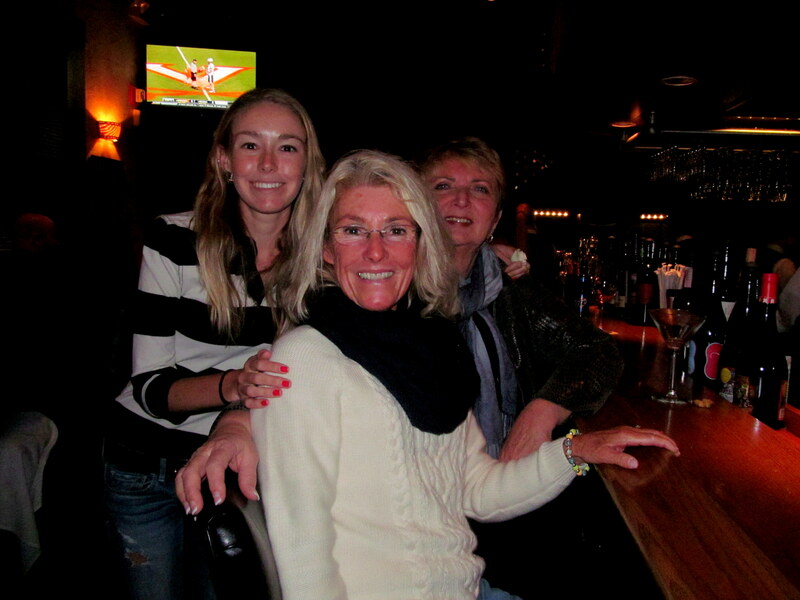 Me, my mom, and Nana Connie at Sunday happy hour. 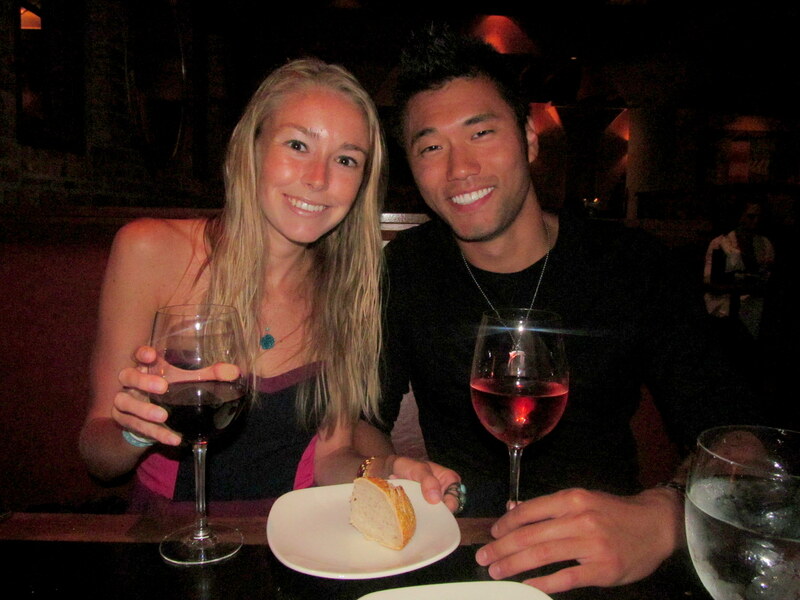 She enjoyed her filet and crab cakes (another first-timer, so I suggested she order that!) 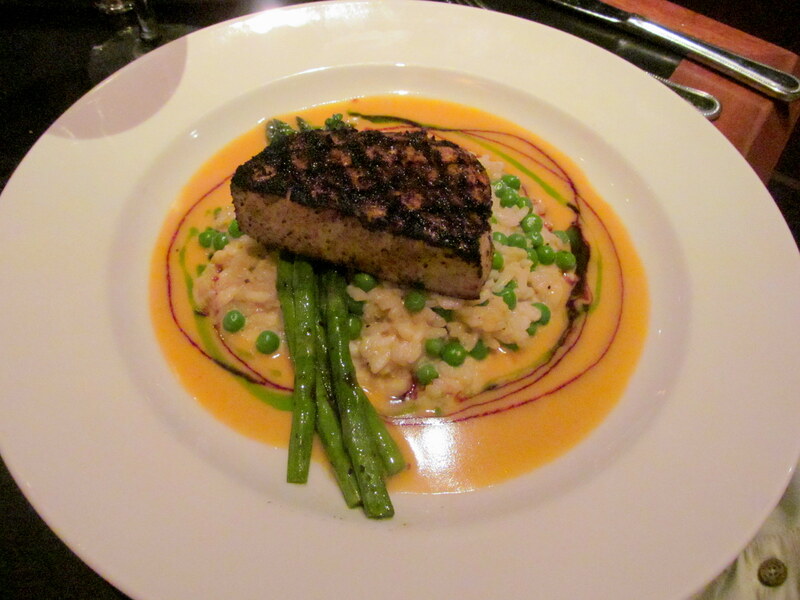 and I adored yet another new-to-me entree choice, the ahi tuna! One thing I don’t often switch up are my sides. 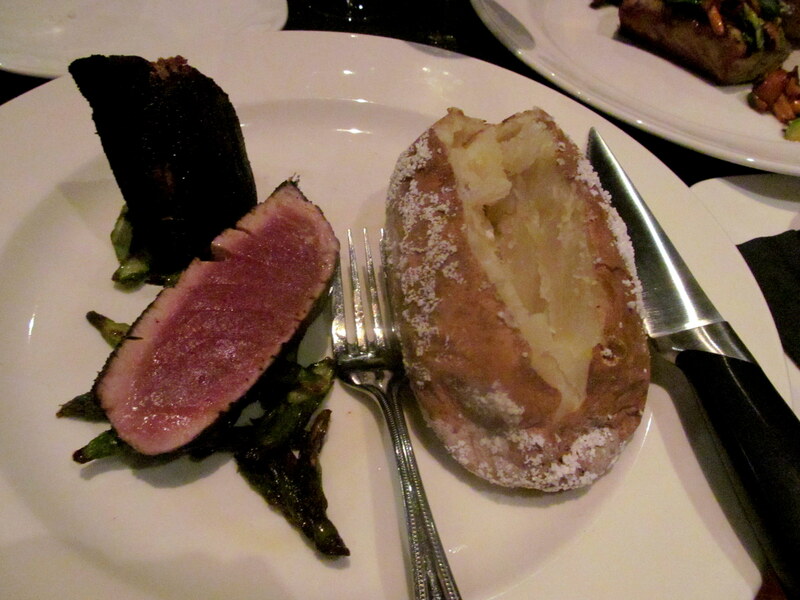 I tend to gravitate towards a baked potato and asparagus almost every single time. Their baked potatoes are truly the best I’ve ever had. So much sea salt on the skin! The weird dark thing in the upper left is actually the charred side of the other piece of tuna. YUM! The waitstaff is very friendly and not at all annoyed (or seemingly not annoyed…) by my mom and I, who are chronic meal-modifiers (sauce on the side, tweaks like that). 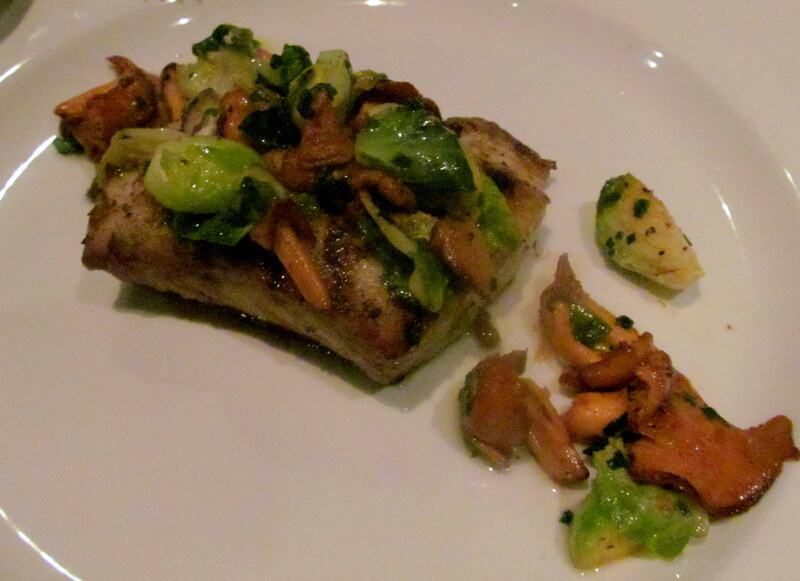 A modified fish my mom ordered, grilled mahi mahi, sans sauce (it was on the side). That’s great news for anyone like myself who loves to dine out frequently, but wants to do so in a health-conscious way. My mom and I also frequently ask for lighter sides like our baked potatoes and asparagus in place of heavier sides like mac n cheese or creamy risotto. 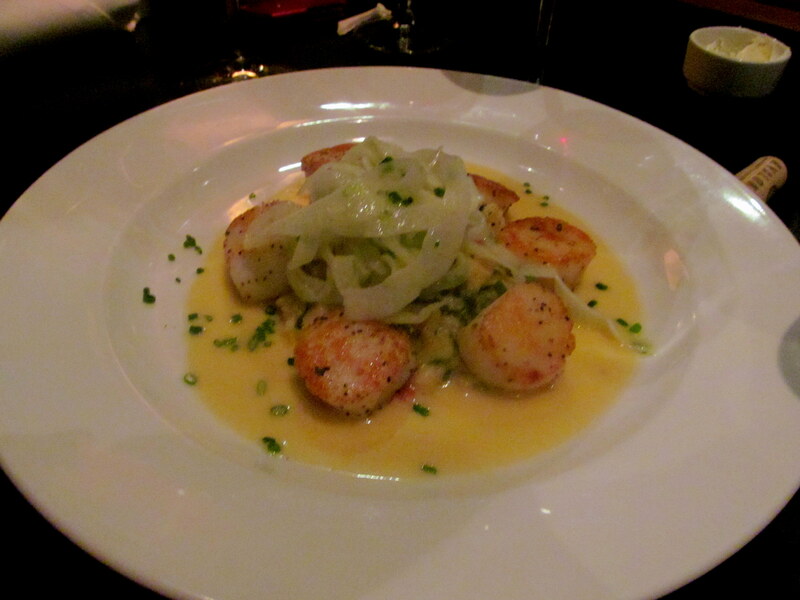 Sea scallops, a favorite of many of my friends and family. But sometimes you have to go all-out and order a meal as-is, AKA as a chef designed it to be served and eaten, as my friend did above when he ordered the sea scallops! 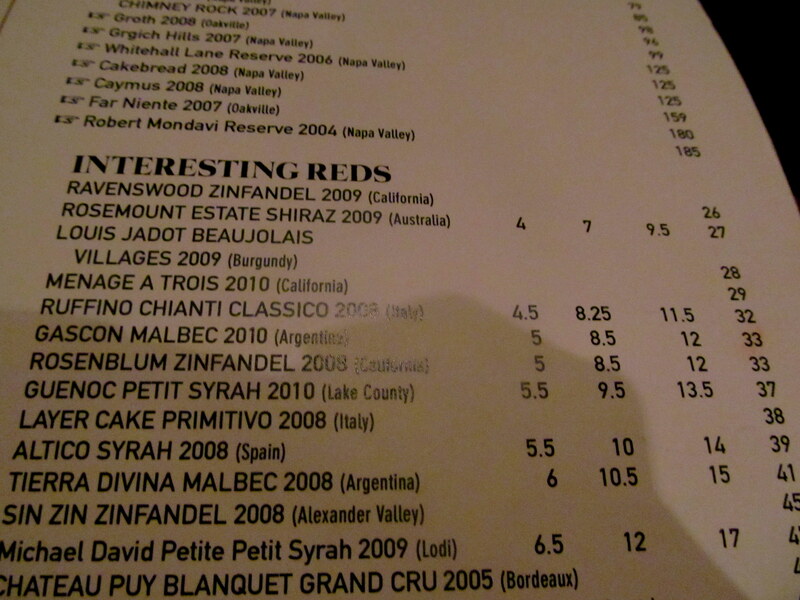 Love/hate relationship with this huge wine list. So hard to choose! So there you have it – now you know what my favorite restaurant is 🙂 If you live in CT, I recommend heading over to J. Gilbert’s (make sure you have a reservation if it’s a holiday or weekend) for dinner, or even popping in for their happy hour if you’re looking for a cheaper way to enjoy their gourmet food. You can also like them on Facebook to get exclusive, random surprise Facebook deals – or join their mailing list! 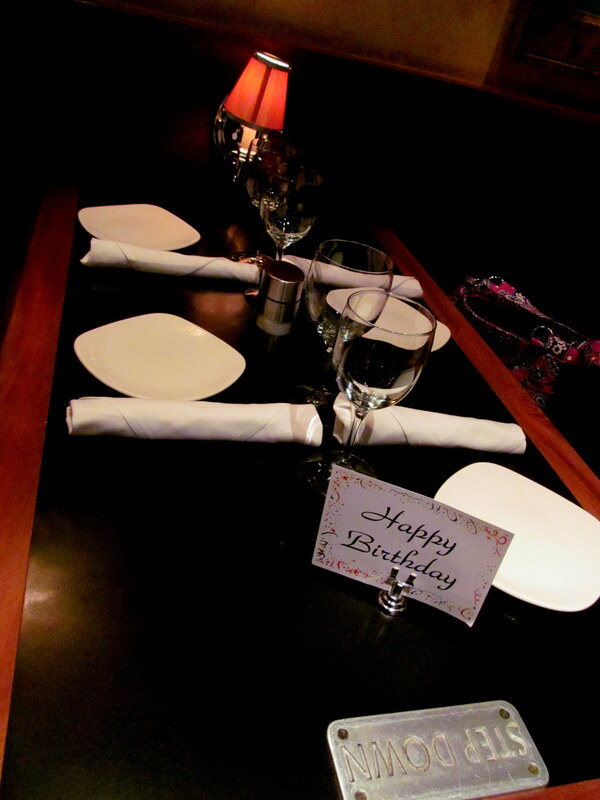 You’ll get a free entree on your birthday, as well as a $15 off coupon right off the bat for signing up. What’s your FAVORITE restaurant? Just one, no cheating! 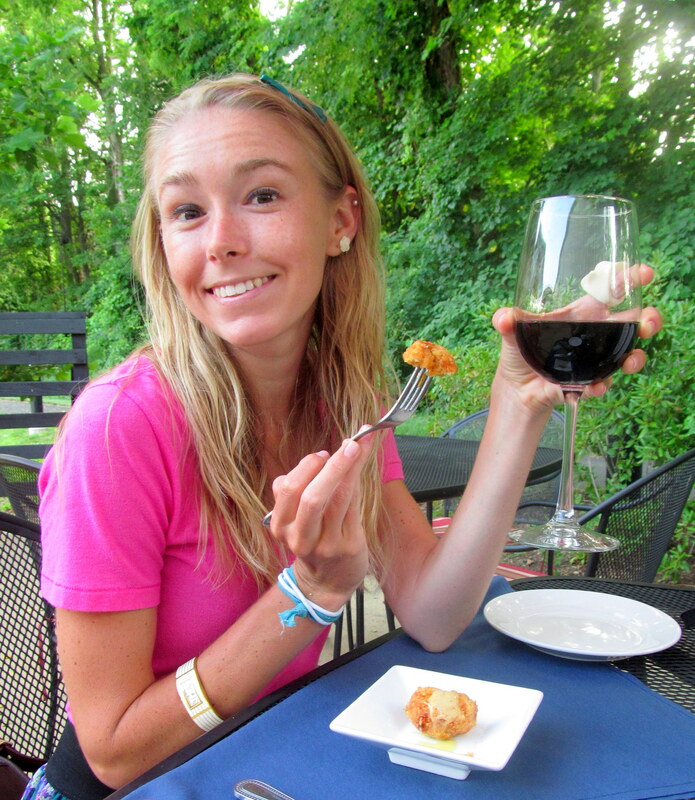 Are you a meal-modifier when dining out like myself? Yesterday my first guest blogger feature was published on LoziLu Mud Run’s website! Check it out for some easy, tasty ideas for a girl’s night in. You can also explore the rest of their site to find a Mud Run near you – I hope to attend the Boston run on 7/7/12 and would LOVE to make a blogger meet-up out of it! Good morning friends, and happy Thursday. We are ALMOST to Friday which means I am ALMOST hopping on a plane to Orlando (Saturday afternoon is when we depart) with my mom to reunite with my wonderful grandparents, who I haven’t seen since December, and my dad, who has been on travel abroad for the last couple of weeks (and I miss him like crazy). Yesterday became a very busy day at work and I got out late, so I was ten minutes late to spin class, but it was all good because one of my favorite instructors was teaching. Not only did she step her game up with her music this week (the last few weeks on Wednesdays it’s been like spinning to the Guitar Hero soundtrack…this time there was some fun mixed in like Carrie’s “Cowboy Casanova”) but she also put us through a REALLY tough workout that involved a three-song hill – OUCH, my quads! The 50-minute cardio session left me feeling sweaty and awesome, so I decided to keep the vibe going and head to the weight room for a quick upper body workout session. I really like to make my upper-body weight lifting similar to a Group Power (like Body Pump) class. I’m not a big fan of lifting heavy weights and then resting in between sets – though I know this is good for building strength! Usually when I do that, I try to do abs in between while my upper body is resting. My favorite way to lift upper body though, is to treat it like my own individual Group Power class and do varying moves back-to-back of one muscle group during an entire song. Then for the next song, I switch it up to another muscle group. By the end of the song, my muscles are always burning and shaking! Last night I rocked Kanye’s “My Beautiful Dark Twisted Fantasy“, one of my favorite albums of all time, for some shoulders, abs, and biceps. I did them in that order because my arms DEFINITELY needed a rest after doing shoulders before I could move on to biceps. I forgot how LONG those Kanye songs are! Grilled chicken/turkey burger with spicy yellow mustard, black beans, baked potato with pico de gallo. I came home and refueled with the amazing dinner above. I also had the inside of the potato, but it’s in a bowl off to the side, and looks pretty bland in photos anyway! The black beans were from Moe’s and I could’ve eaten an entire pot of them – I just love black beans so much. I’m grateful to be living at home with a mother who is always up for making me healthy, delicious meals! I’m going out to eat tonight to my favorite restaurant, J. Gilbert’s, to use a $20-off coupon I got back in December. It expires while we’re away next week so it must be used! Joe and my wonderful Nana Connie (she arrives today to take care of my brother while we are gone in FL – I’m so glad she is coming!) are going to join my mom, brother, and I for dinner. I also plan to order one of their wine flights – I have never tried theirs and will definitely be craving some vino with my meal! 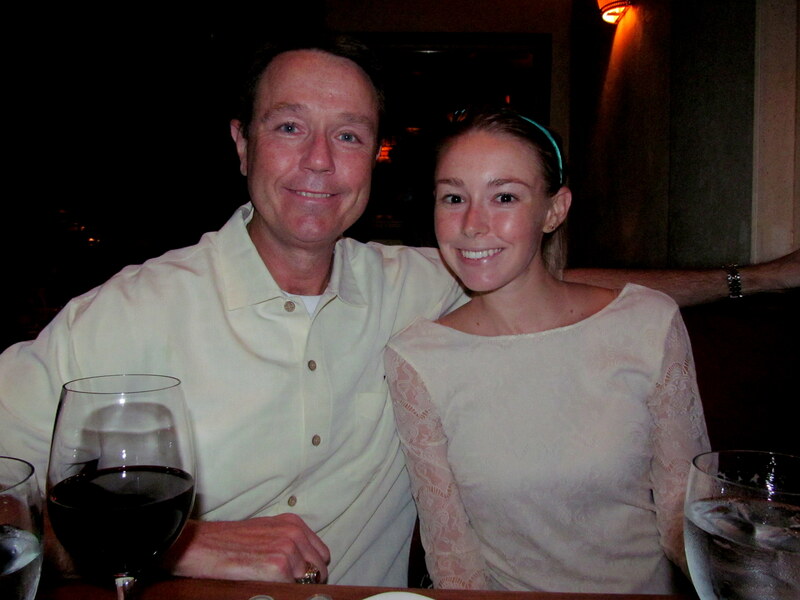 Joe and I at dinner this past Saturday night at Grant's in West Hartford. 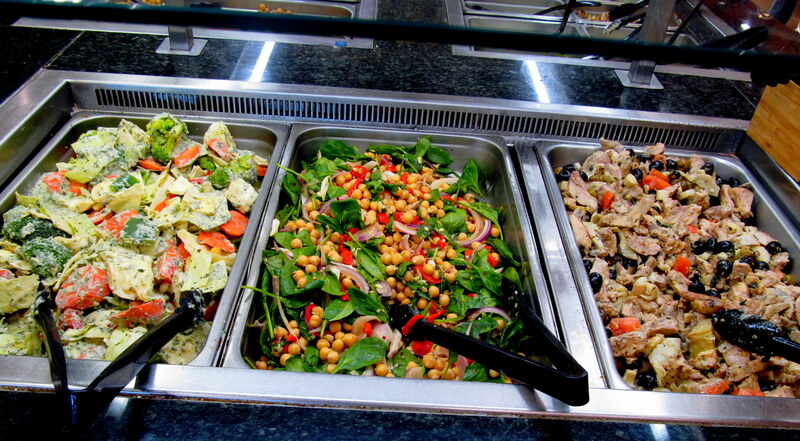 I’m going to end today’s post with some random photos that I took during my December Florida vacation at the Palm Beach Gardens Whole Foods salad/hot bars. I never got a chance to share them and I love seeing what Whole Foods locations across the country have at their food bars – does this make me a nerd? No, I think it just makes me a foodie 🙂 Enjoy! LOVE the colors in this photo. DOLMADES! Was so excited when I saw these. 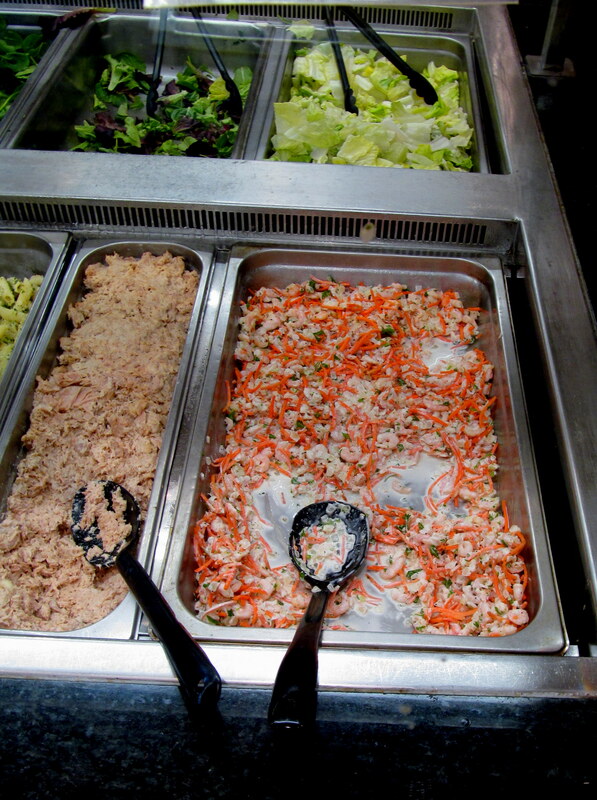 FL Whole Foods locations always offer some kind of great seafood salad like the shrimp salad above! The colorful lettuce-less Greek salad in the middle was so good, but the onions were STRONG! Plantains make my heart happy! Have you ever noticed differences in Whole Foods location offerings across the country? 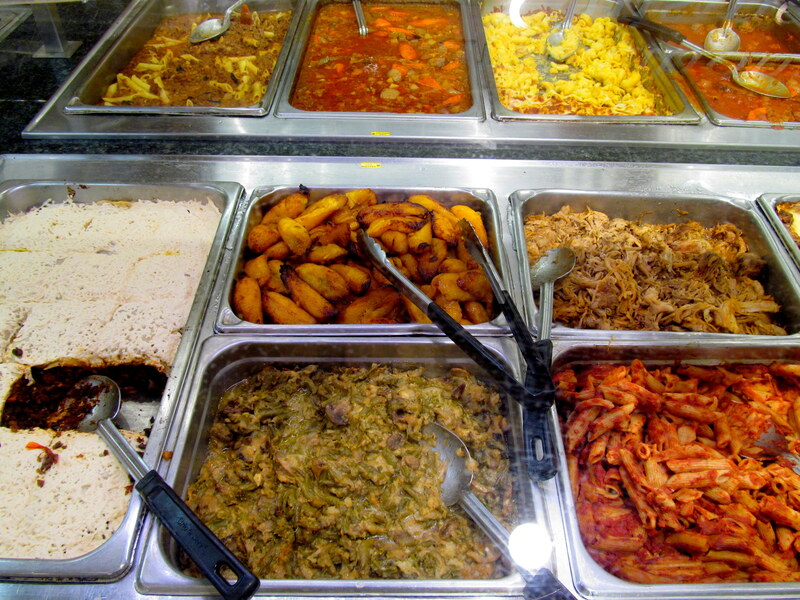 Any of the items above look familiar from your local Whole Foods – OR completely foreign? What’s your favorite way to lift upper body weights? Anyone else have exciting Thursday dinner plans? Around my area, Max Restaurant Group is king. Their eight independent restaurants are all extremely successful and known for some of the best-tasting food and highest-quality drinks in the state. 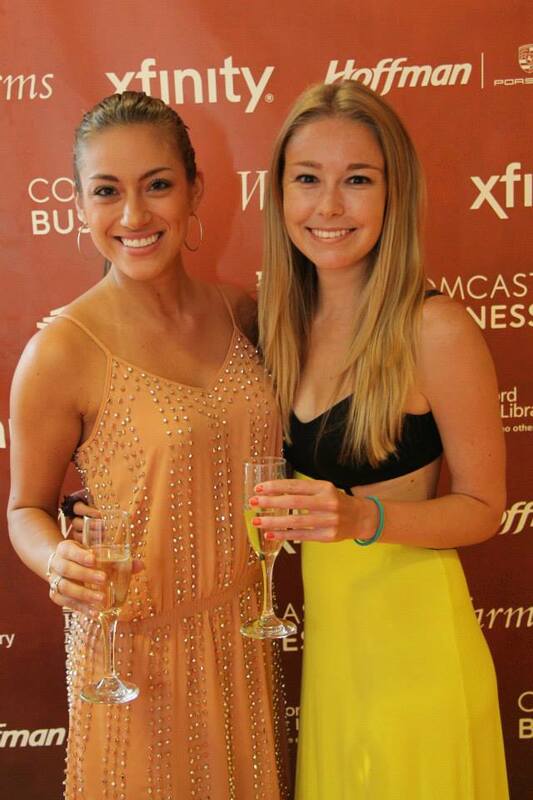 MRG also puts on lots of foodie-and-wino-targeted events. Though I’ve only heard great things about what’s served, I also have noticed that most of the events have quite a price tag. So imagine how pleasantly surprised I was when I saw an event on the calendar for January that was only $35/person – the “2012 Oysters and…” tasting of oysters from Max Fish, one of the MRG restaurants specializing in seafood, and white wines from Willamette Valley Vineyards, brought by the founder of the vineyard himself, Jim Bernau. 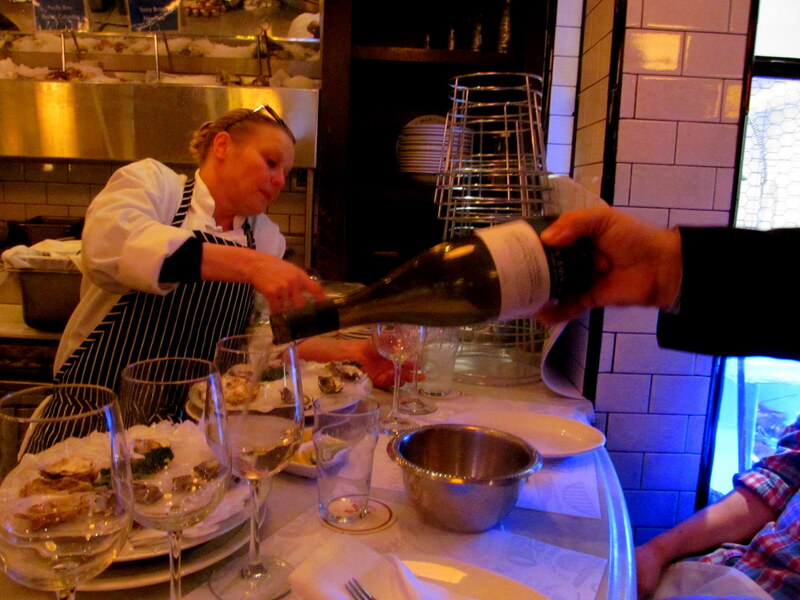 A chef completing rapid setup between tastings – there were three times, and we came for the second! My dining partners at this event were my go-to foodie guys, Jeff and Evan. In fact, I have another tasting we attended not-so-recently that I hope to recap this week, but that’s neither here nor there. Both still and sparkling water were offered – fancy! I was beyond pleasantly surprised to see Jim himself there representing Willamette Valley Vineyards, because I had actually met him the day before at the Sun WineFest! In fact, his Willamette Pinot Noir (yum) was my very last sip of alcohol of the day, right before I headed to the main stage to cover the Oyster Open. The WineFest, by the way, occurred the day before this oyster and white wine tasting, so I considered it an extension of my WineFest culinary adventure! Oyster expert Kim Kockza taught us a lot about what we were about to eat, and continued to educate us about oysters as we slurped them down. So much goes into oyster farming! Southern oysters of the US take about 12-18 months to grow, whereas are some oysters grown around the world that take up to seven years. Oysters are often grown in a controlled environment to the size of a quarter, and then released into bodies of water so that they can nom on plankton all day and get nice and beefy for OUR consumption. They eat, then we eat, the circle of life! When Evan tried to squeeze lemon onto his first oyster, Kim certainly gave him a talking to. She wouldn’t allow it! 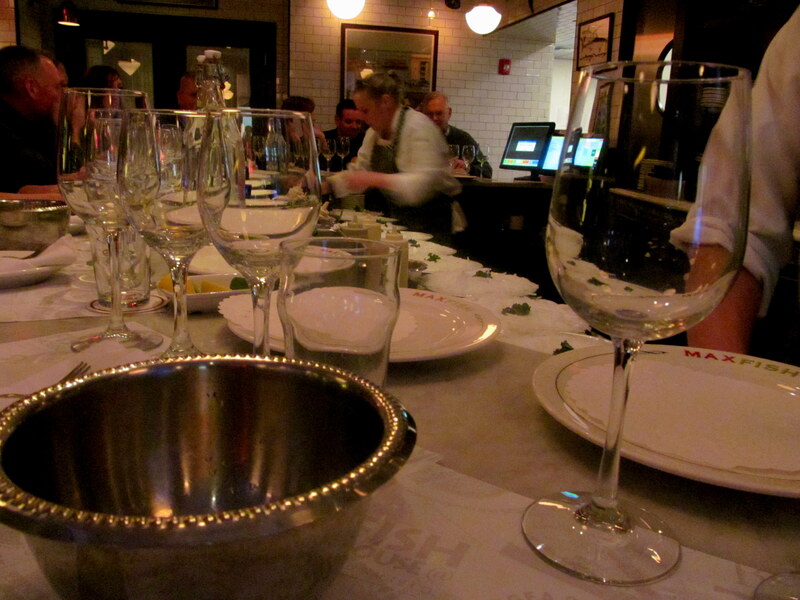 We had no sauces either – this event was all about tasting the oyster in its purest form. Oysters taste different depending on what species they are, where they are farmed, the farmers’ methods, and more. I’m extremely inexperienced with oysters – in fact, this was my first time having them raw like this – but I could still tell that a difference existed between certain species. Some had subtle flavor variations that I preferred to others. However, all of the oysters (no matter what kind) had the unfortunate habit of shedding little pieces of shell that kept getting caught on my tongue and in my teeth! 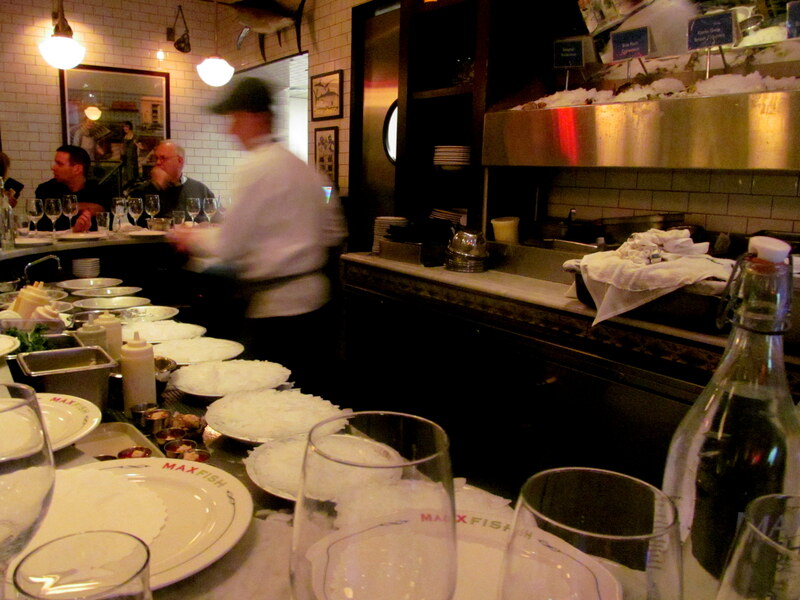 All of the oysters we sampled at Max Fish were from British Columbia. Three species were paired with three different white wines. Another slightly adventurous event for me, since I am a red lover at heart (hearts are red, ha! ), and I have been trying to explore whites and give them a chance. I did not like any of these whites as much as a red, but pairing them with the oysters was certainly fun! 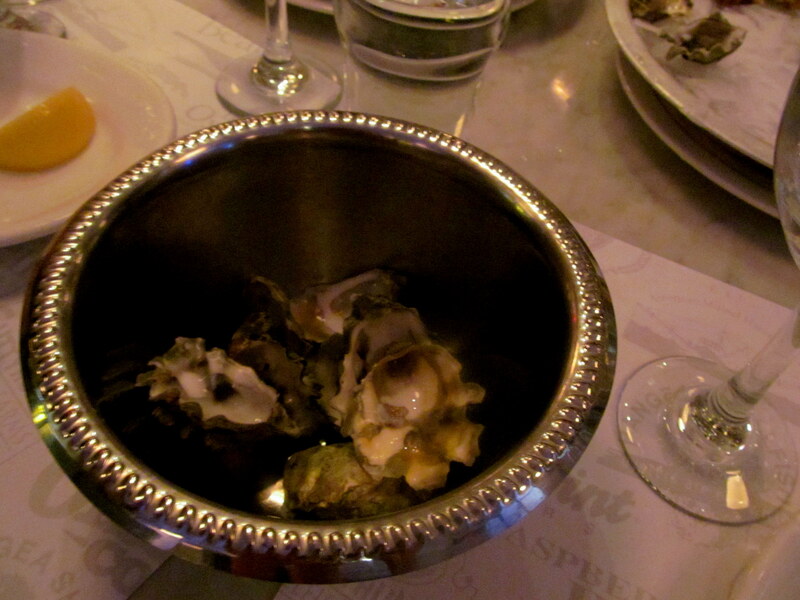 Gigamoto oysters with 2009 Pinot Gris: I enjoyed the wine portion of this pairing more than the oysters. They tasted very, well, raw. The taste was a bit more harsh and in-your-face seafood (if that makes any sense) than I would have preferred. 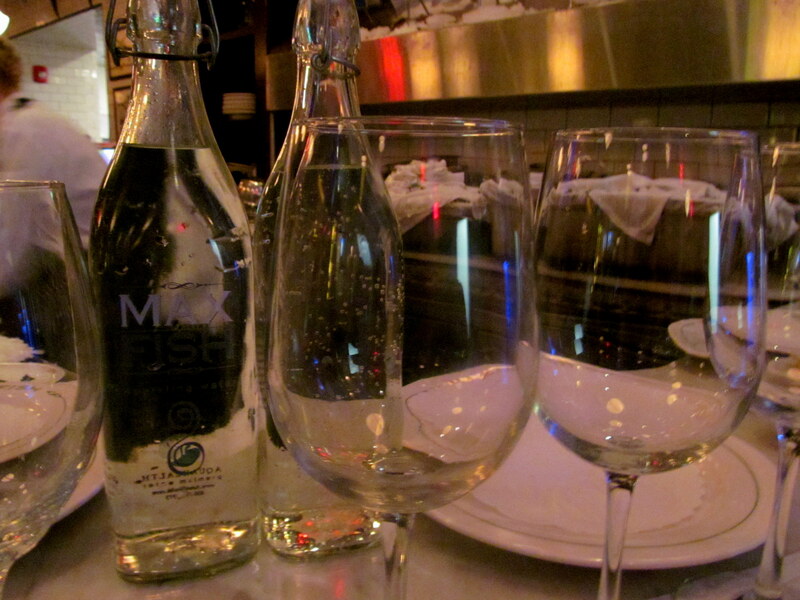 The Pinot Gris and its clean taste did pair well with them and each sip was a satisfying cleanse to the palate. These oysters, though, were not really for me. Miyagi oysters with 2010 Riesling: These oysters definitely tasted better thanks to their creamier texture. Kim showed us that the oyster’s white belly could tip us off before even tasting it that creaminess would come into play here. 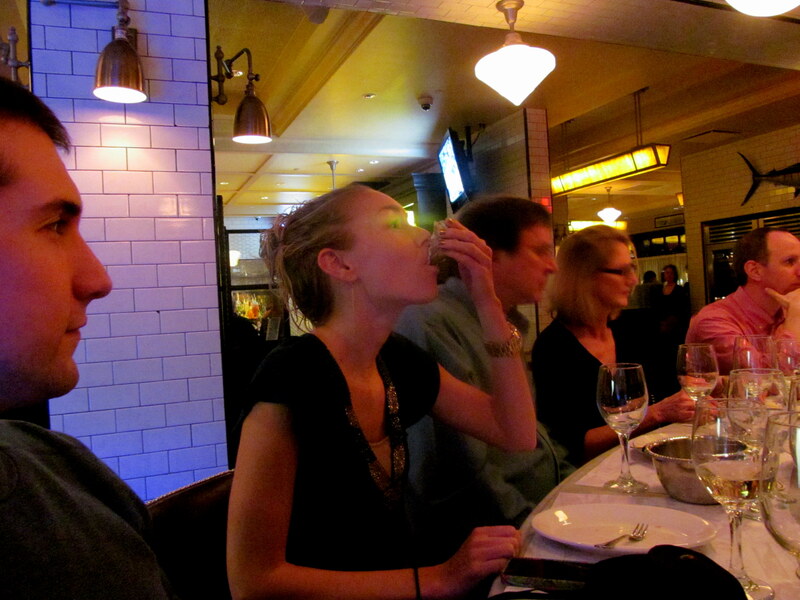 At first sip, the Riesling was way too sweet for me (they usually are). 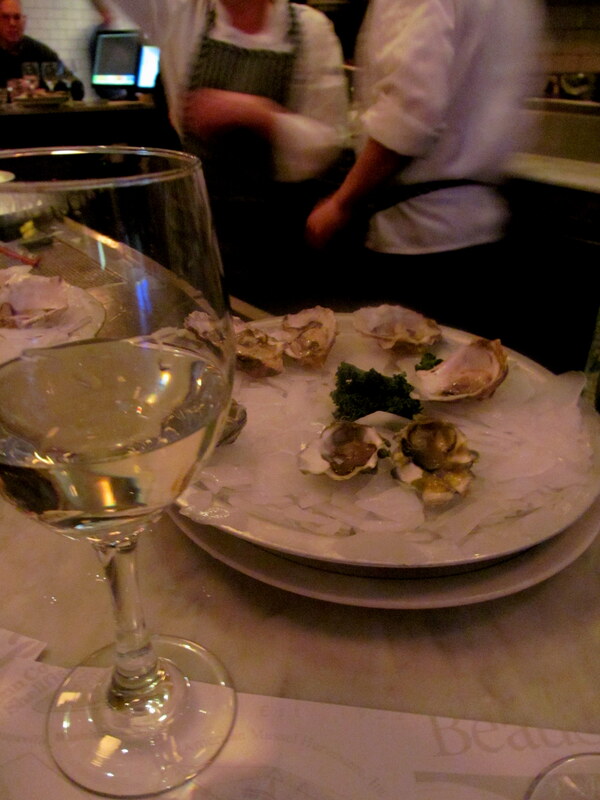 However as I continued to pair the miyagi oysters with the wine, I enjoyed the Riesling more and more. Pacific rim oysters with 2009 Chardonnay: I was not the biggest fan of the Chardonnay paired with these oysters. I’m not sure if it was the oysters, or the wine (it’s hard for me to like a Chardonnay) but I definitely preferred the other two whites to this wine. These oysters were more similar to the gigamotos to me (less creamy than the miyagis). 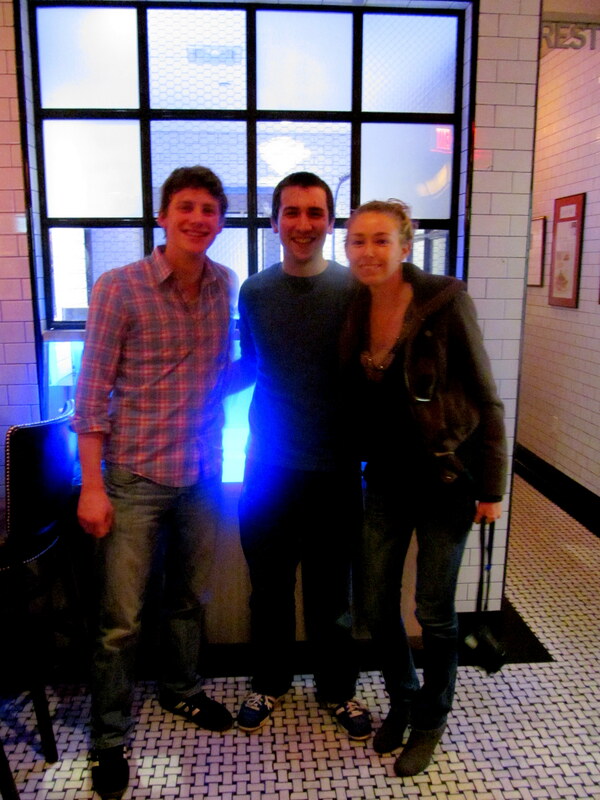 Jim is a great guy, so down-to-earth, and he gave us lots of good wine education while we slurped and sipped! Willamette Valley is in Oregan, and Jim has owned the land for 29 years. His key wine making principle is stewardship of the land, so anyone buying Willamette Valley wines can be confident that the beauty of the valley is preserved and the land is well cared for before, during, and after harvest. Jim’s passion for his wines really shines through. 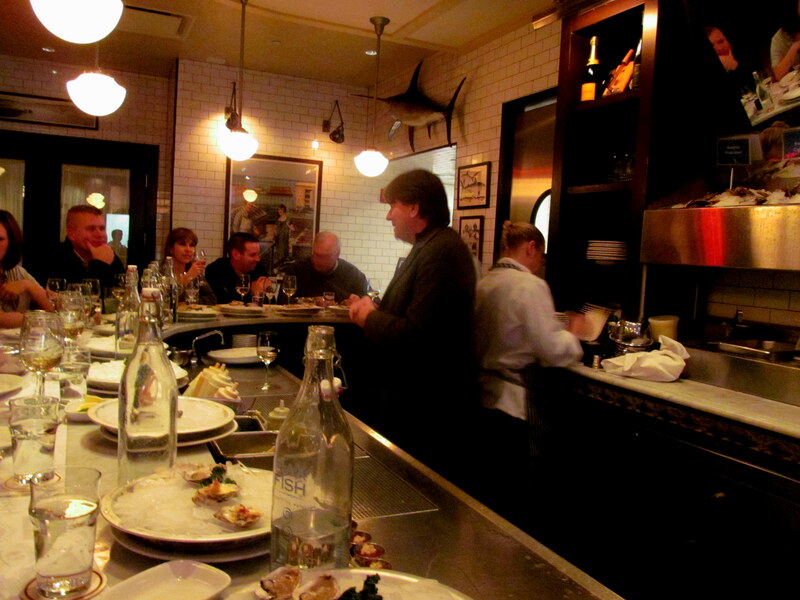 Our last portion of the tasting involved some oysters that had been “tinkered” with – in the best way! Instead of served raw, these were served with some tasty garnishes. 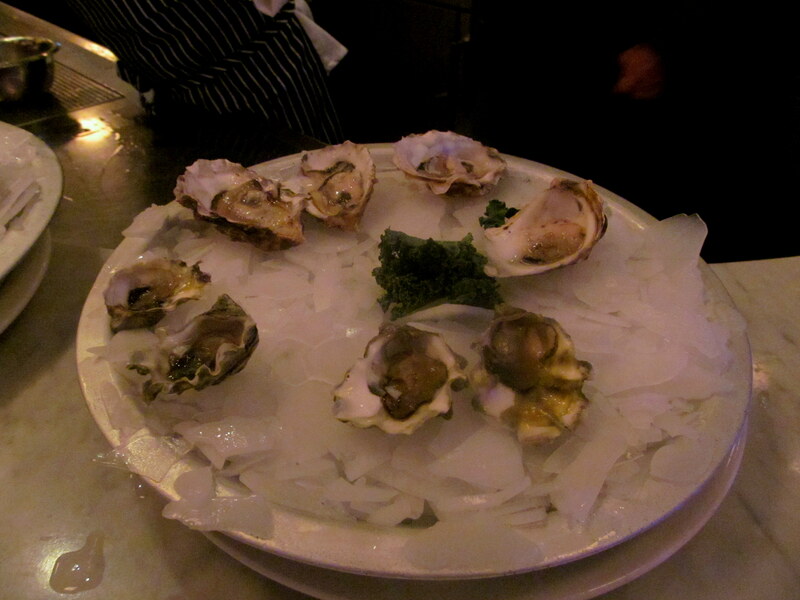 On the left are two oysters topped with a chard gilee and chives. 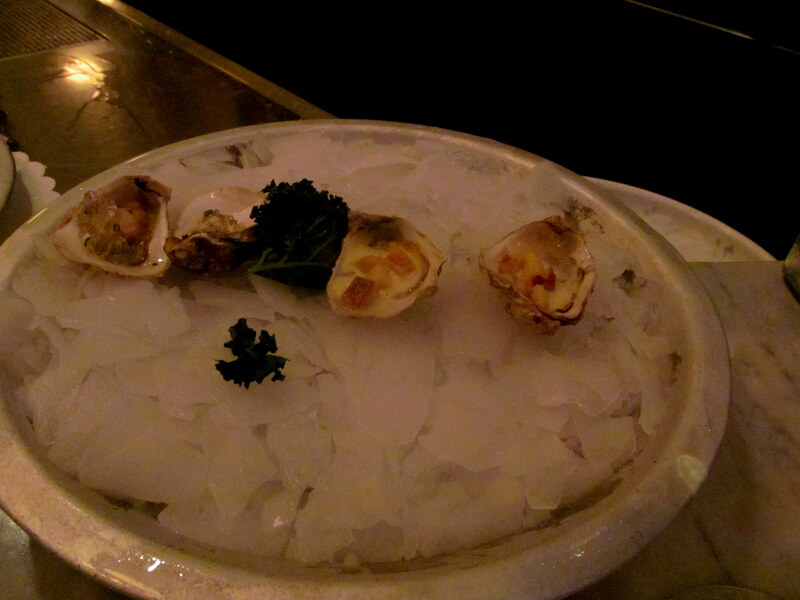 On the right are two oysters topped with an apple-bacon relish! I liked those the most out of the two (kinda obvious, it’s bacon), but the chard gilee oysters were great as well, and both went well with some leftover Chardonnay I still had. In fact, I liked the Chardonnay a little more after I paired it with these beauties! I have to say, raw oysters are not exactly for me r. I don’t think I’d ever order them out, but when it comes to garnished or stuffed oysters, I’m game! I think Jeff is judging me. Evan went with the slurping method, and I hate to say it, but I think he wins this round. He looks fancy! 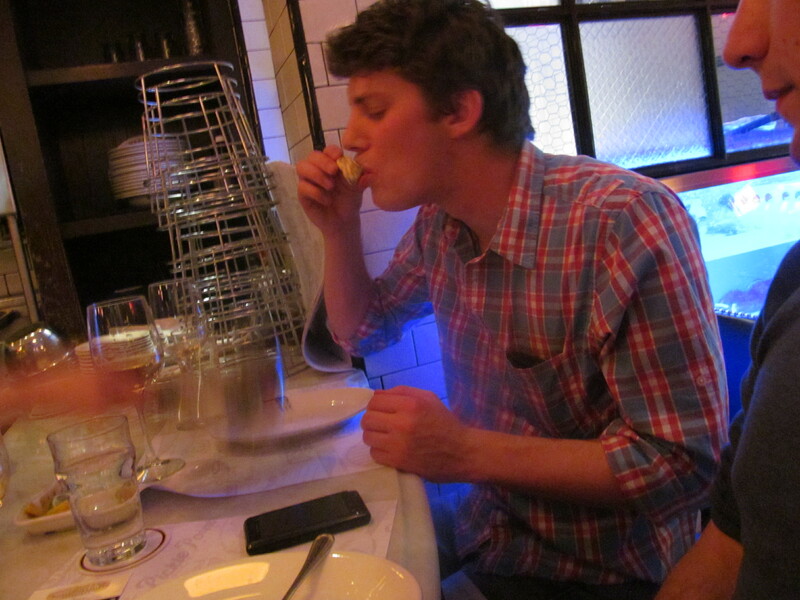 Or like he’s making out with the oyster. Before we left, the three of us had to get a photo with the lobster tank. Too bad we failed and stood directly in front of it. After leaving, we proceeded to J. Gilbert’s to take advantage of a free appetizer FourSquare deal and oh yeah, split a bottle of wine. Then back to Max Fish for late night happy hour bites. Yes, it was a bit of a spontaneous Monday out, but we kept it both cheap and sophisticated. Our free J. Gilbert’s Maytag bleu cheese chips, and red wine (not free)! My Max Fish happy hour cheese plate (wine = cheese plate cravings, always). Max Fish happy hour Thai Shrimp Toast. Jeff continues his hand modeling career. 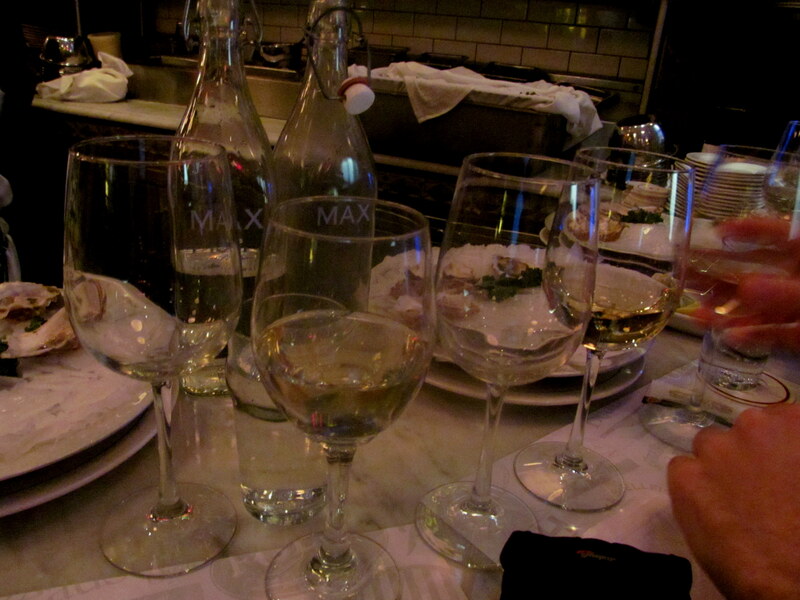 Thanks to Max Fish for hosting a cool event and to Jim for sharing his wines with us! How much experience do you have with oysters? What about white wines?